If you’re a busy man with little time to fuss over your hair, the Brush Cut may be for you. Easy to cut and easier to upkeep, it accentuates your face, while allowing for daily variations. Dampen the hair and comb it out. Select your Wahl clipper’s appropriate attachment guard for the desired length. Start in front of the right ear and cut the hair in sections 1, 2 and 3. Be sure to cut the hair at the nape of the neck. 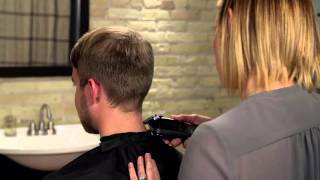 Blend the hair from section 3 to section 4 by moving the clipper straight up. To cut the hair in section 4, hold the hair straight up and use the technique that you are most comfortable with, such as clipper-over-fingers to shorten the hair. Cut the top of the head from front to back. To complete the look, trim the sideburns, around the ears and neckline using the inverted clipper technique or with a Wahl trimmer. Use styling gel to finish the cut, if desired.